I have always wanted to visit Malibu, since I was a teenager. I finally made It there, this past June. It was everything I've seen in pictures and more! Malibu is just 3o minutes west of Los Angeles. The city is known as "21 Miles of Scenic Beauty." It is situated along the Pacific coast highway, a long stretch of dreamy beach scenery. Palatial homes sit suspended on the edge of tall cliffs, a mile up from the beach. Most of them, I'm sure inhabited by movie stars and other entertainment professionals. I was with my friend Joanie, on the trip to Malibu. On the way back to L.A we traveled through the Santa Monica mountains. I was on the edge of my seat as we navigated the tall canyon & hairpin curves-but oh what a view! There are several beaches along the Malibu coast, but we only had time for one. My friend convinced me that Paradise Cove was the spot ! If you only have a short time to spend In Malibu, I highly recommend visiting the cove. Wiggle your toes in the sand, as you eat breakfast with the sunrise : or sit inside. Either way, the scene in front of you is sure to please. The sand patio with umbrellas for cover, is where we chose to dine. It was a bit annoying getting sand stuck in my sandals, but so worth it. This is the best beach dining , with relaxation on order all day long! There were so many yummy breakfast options to choose from, all of it sounded fabulous. I could not believe my eyes when my meal was delivered to our table. The portions were huge. My eyes got big as saucers, and I wondered how I was going to eat it all ! Also, the cuppa jo was good til the last drop! 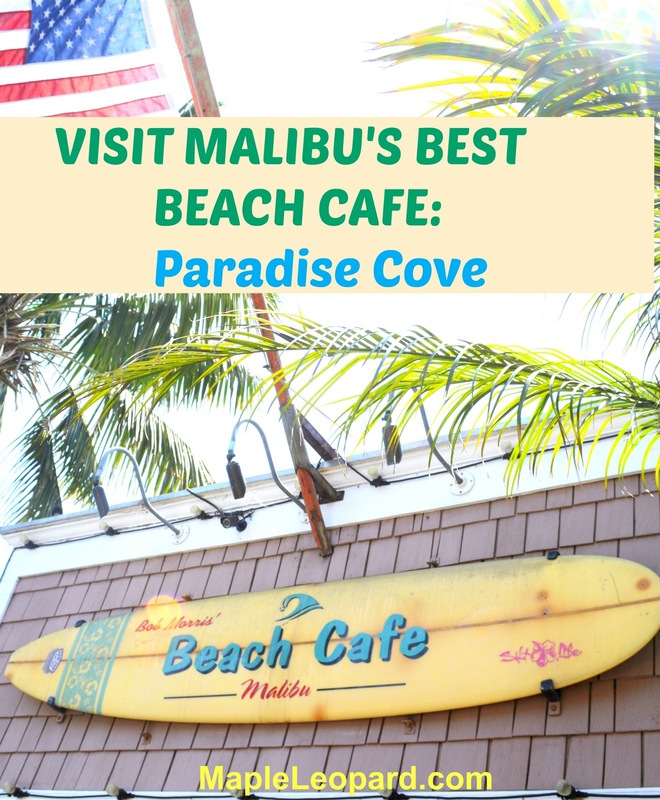 Paradise Cove is a great place for family or friends to enjoy the beach. We were only able to stay for a few hours. We arrived about 9 a.m. and this time of day was perfect, the beach was not crowded at all. The water was the most beautiful light aqua color, I've ever seen at a beach. I heard the waves here can be ferocious at times, a surfer's delight for sure. There is equipment to rent if you are brave enough to try it, ha count me out! I would like to learn to surf someday, but in a place with baby sized waves. The only drawback about this beach: you have to pay to play. The parking fee is 35.00 unless you eat at the café. If you do decide to dine, then the parking is only 6.00. However you are limited to a stay of 4 hours. Four hours was plenty of time to eat, take in the panoramic views and enjoy the beach. Next time, I want to get a hotel and stay longer. I hope you enjoyed the tour of Paradise Cove! If you are fan of California beaches and attractions: Check out more CA articles on my travel page here. Malibu like most CA beaches, has a casual laid back vibe. When it comes to dressing for the beach, I say wear what is most comfortable for you and your lifestyle. Some peeps are comfortable wearing their suit all day long, and others prefer to be covered up. I love this aqua colored beach cover up. It wears great as a dress out in town as well! I found it last summer at my friend's boutique in Milwaukee: check out Free Bird Style FB for the chicest outfits for all seasons. Have you ever eaten breakfast on the sand at a beach café? Ha yes Andrea...anywhere in SOCal is paradise in my books. but especially here! thanks for the comment! This looks adorable! I'm planning a trip to Malibu and will have to add this to my list! Have a great time Giulia! Those surf boards look super cool. Definitely have to check out Paradise cove when I am in LA next time. The surf boards were def a great photo opp! Def a must see spot! Hi Carola, I'm glad you liked the post and I hope you can go someday soon! This is amazing!!! And literally my favorite type of place anytime I go to he beach I want to eat where there is sand. Thank you Laci...it was my first time to eat at this kind of spot..it truly was dreamy! I've been out west 3x and have yet to visit Malibu! Why....?!? Absolutely beautiful and you guys look adorbs! Well Evonne..you are not alone. I have been to So CAl hundreds of times so it seems, and have NEVER stopped in Malibu..it's kind of off the beaten path so that's why many miss it! This looks like an amazing trip! I definitely need to make my way out to Paradise Cove! You for sure need to go here..its just simply devine! Ha ha girl..I hear you..I am in Seattle..hoping to move close to a beach soon! I agree the parking fee Is steep, but you can avoid it buy eating lunch, which most end up doing anyway! What a gorgeous beach, and I love that it's family friendly! Have never been to Malibu, but I may have to schedule a trip! Hey Nichole..it's crazy I have made many many trips to LA and never taken time to go there, it was so amazing...do go if you can! The photos look great! You guys also look like you're having a lot of fun! I actually haven't been there yet. Looking forward to visiting. Thank you so much...It was everything you hear about Malibu..pure BLISS!! Hope you can go soon! Looks awesome! Fun to be able to eat right on the sand. I'll have to add this to the list of places to visit in Ca. IT was amazing indeed...I always go to LA and don't make time for here..cuz its off the beaten path..it's not that far tho! Ha ha Jen..yes I agree...steep..but most people eat out when the do beach trips.so yeah just eat there and then problem solved! This is such a coincidence since this week I wrote my Ultimate Bucket List for Los Angeles and included Paradise Cove even though I have not been. I know it is kind of a classic here in LA, so, I have to make it there one day. Your photos look fantastic. Malibu really lives to the hype. Hi Ruth...you are lucky to live so closeby..I would DIE to live in LA..ha I am working on a move there or to Vegas..somewhere warm. I love this spot...such a fab spot! Thanks for stopping by! I need to visit this beach!! Looks amazing!!! Hey Ruthie..Oh yes you dooooo! Coming to visit some of my family members next year! Definitely adding to my bucket list of places to eat while I'm there. Cant wait to be by the beach hehe. Wow that sounds exciting have a great time and hope you get to Malibu! Looks like a great spot! I have yet to make it to Malibu -- how beautiful! I would be terrified on the mountain drive, too, but worth it! You're beach outfit is so cute! Thank you for stopping by, I hope you go...it took me years to get there myself..ha! Glad you liked the cover up and thanks! Malibu is one of my very favorite places!!! We just visited last spring - I can't wait to get back to the beach! Yep I love the beach ..planning to move there or to Vegas...soon! We will be there for a wedding this winter, can't wait!! Weddings are so fun and even better on the beach, have an amazing time! I've driven right past this place several times, but never had the time to stop in for a swim :( It looks just as I imagined, with those beautiful beaches and palms! Sounds like you had a great day checking off your bucket list! Love the cover up too! Thank you Susanna, well hopefully you can make it there sometime soon! Ah I was just there but wish I had read this post sooner! Definitely would have stopped by, the views are stunning! Awe sorry you missed it..hope you can go back soon! Ah bummer sorry you missed it, hope you can go again soon! Wow for a wedding?! That will be so fun! Love your blog. Very informative. Superb photos too. Thank you so much Sonika!~! Happy travel girl!